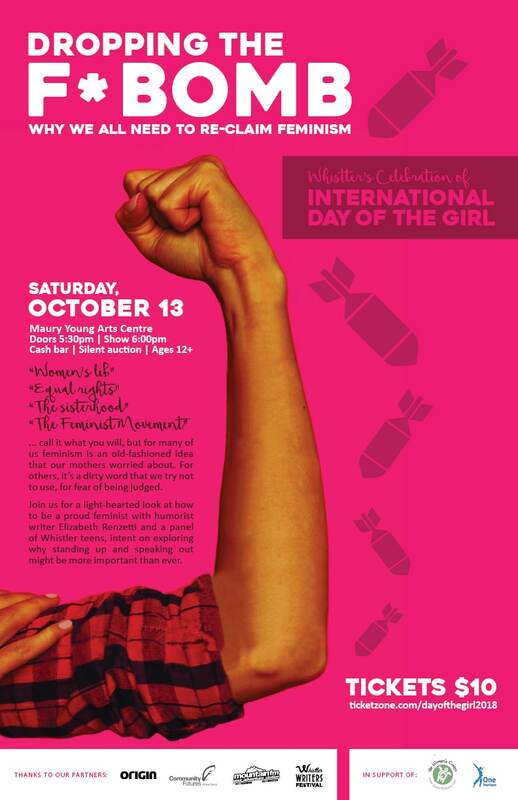 The Whistler Writing Society is proud to support Whistler’s Celebration of INTERNATIONAL DAY OF THE GIRL and their event Dropping the F*Bomb: Why we all need to re-claim feminism. The event takes place Saturday October 13, 6:00pm at Maury Young Arts Centre, and is designed for anyone ages 12+. …call it what you will, bur for many of us feminism is an old-fashioned idea that our mothers worried about. For others, it’s a dirty word that we try not to use, for fear of being judged. Join us for a light-hearted look at how to be a proud feminist with humorist writer Elizabeth Renzetti and a panel of Whistler teens, intent on exploring why standing up and speaking out might be more important than ever. Get tickets here.